I have been trying out various options for the Block of the Month Quilt, Round the Year! I will show you one option in each of the next few posts and include patterns for sashings and borders. The next block, Block # 5, will be posted only on 15th October. In the first two weeks of October, you can catch up with pending blocks, set your circles in squares, ready the borders, sashing, binding etc! Or, if you want to `quilt as you go’ the first four blocks, perhaps you can start on that! I shall be posting these so that you can decide which one you want to do. Of course, each of the 16 blocks will be different, but you get the general idea! In case you want the patterns for the blocks featured in this quilt picture above (or below), they are available for free, right here, on this blog! Just type “Round the Year’ in the searchbox, and the posts will pop up. I am trying to create a page where all the links will be available in one place, as soon as I can figure out how! This is one option I really like. In this layout, the interplay of dark and light grey in the background brings alive the theme of dusk falling. The blocks are simply joined together and a thin 1.5″ dark grey border and binding frames the blocks, making it up to a comfortable 75″ square size. What would you call this layout? I am undecided between `Shadows’ and `Clouds’! Here is how the Rainbow Quilt will look, in the same layout… A white and black combination ( instead of blue and grey) for the background would look stunning, but I would prefer that for a wall quilt rather than a bed quilt! I’ll give you a dekko at that in my next post! If you come up with some options, we’d all love to see those, too! Meanwhile. I’ll get back to my design desk(top) for a few more layouts! is the fourth block in the Dusk colourway in the Block of the Month Quilt, Round the Year. The templates and instructions for the other colourway “Rainbow” have already been posted last week. Like the previous three blocks, this one is also paper foundation pieced and finishes at 18″ square with a 15″ inset circle. The pattern, fabric requirement and piecing instructions can be downloaded from the links at the end of this post. I am yet to make this block in this colourway. 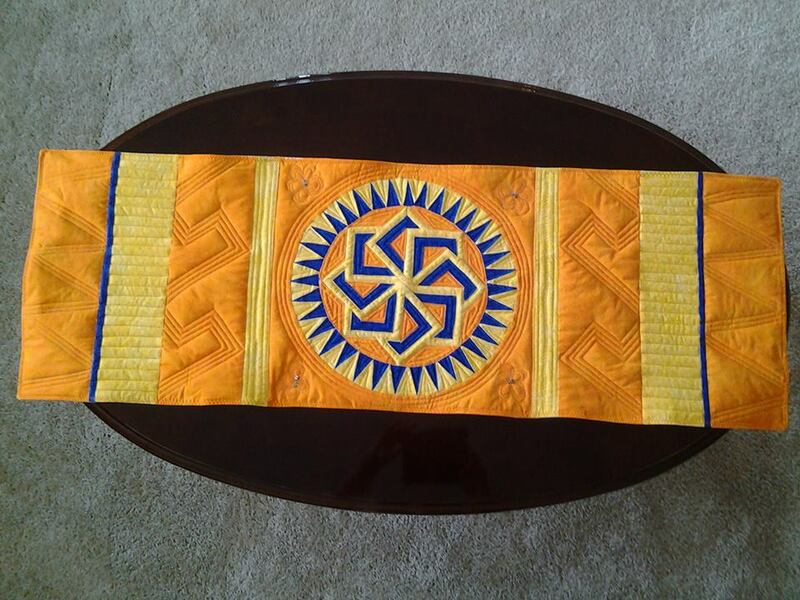 I plan to use 4 shades of blue fabric from deep to light in this block, contrasted with 4 fabrics ranging from deep orange through light orange and gold to yellow. The background is planned in 2 shades of grey. Here is a look at some of the fabric I have been auditioning for the block! It is Fossil Fern by Benartex – I just love that fabric! Meanwhile, I am utilising this post to list out of a few do’s and don’t’s to keep in mind when paper piecing the blocks from this quilt! 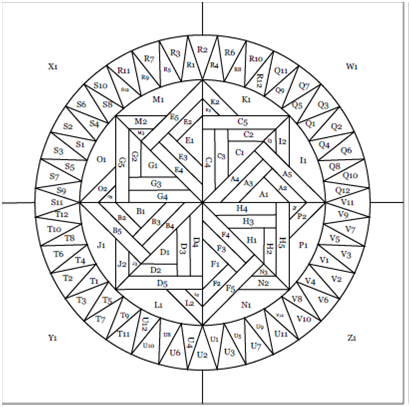 Reminder – the templates for the Round the Year quilt blocks are printed mirror images. Check to see if the templates are to be printed in portrait or landscape mode – adjust the printer setting accordingly. Take print outs of the Template file with printer settings at 100% or actual size. I often have people ask me if they can increase the printer settings to, say, 120% if a larger block is needed. It does not work that way, if you have the ¼” seam allowance added on to the template ( as is the case with the Round the Year block templates). You will end up increasing the seam allowance also to 120%! 4. I hate all the paper wastage involved when printing the templates – often one template occupies one whole page! Where possible, I like to use my unthreaded sewing machine to needle punch up to 7-8 templates at a time from waste paper stapled to a printed template. Tissue paper works great! 5. I like to cut the templates a bit larger on all sides and trim them after piecing. It may be just superstition, I don’t know! I just like the thought of some margin in case things go wrong somewhere! 6. This can never be stressed enough – starch and press your fabric! It makes all the difference between a block that looks like it has been pieced by an experienced quilter versus a beginner! Every minute spent on this stage will be well worth it! 7. What I love about paper piecing is that you don’t have to be very accurate when cutting the fabric. All my fabric requirement charts give you plenty of margin. Personally, I like to keep a boxful of all the scraps from the quilt blocks to look into before I start cutting fresh fabric. 8. After cutting the fabric pieces, I can save a lot of heartburn if I remember to pin the pieces to the respective templates! At this stage, I also get a chance to check if I have missed out on a piece or two. 9. I like to sort out the templates shape wise unless specifically asked not to. There is a possibility you can chain piece them and why miss the opportunity? 10. Set your machine stitch length to 1.5 (or about 15-20 stitches per inch). You want to be able to tear away the paper, without getting the stitches all loosened up. 11. It may sound obvious, but please remember to begin with piece #1 and #2 when you start piecing a template! Place fabric piece #1 with the wrong side touching the paper on the unprinted side. Hold it against the light to see that the entire area of piece #1 is covered plus a ¼” seam allowance. Place piece#2 on top of piece #1, right sides together. ALWAYS – right sides touching each other. Align the edges of the two pieces at seam between #1 and #2 – overlapping ¼” beyond the seam line. 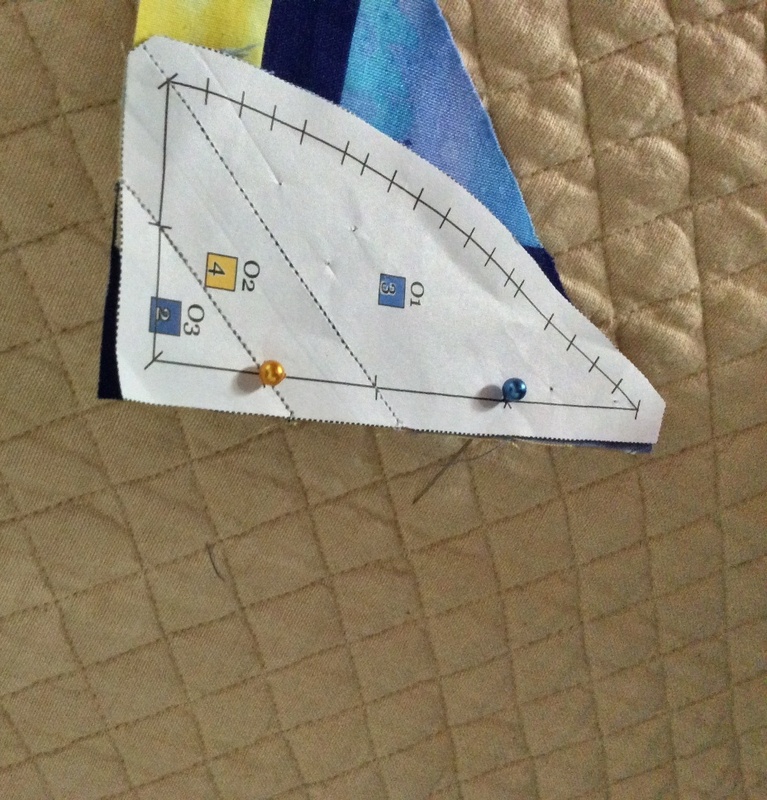 Pin the two pieces together before flipping to printed side of paper and stitching on seam line. Trim the seam allowance to ¼”. Press open fabric piece #2 and hold the template against light to check that it covers the printed area #2 plus ¼” seam allowance on all sides. We are now ready to stitch piece #3…repeat as for pieces #1 and #2! Repeat for all the numbered pieces – in the correct order, till the whole template is pieced. 12. When all the templates are pieced and ready to be assembled, trim the templates to the right size – to the outer dotted line in the case of my block templates. 13. Each of the block patterns includes a Master Template, which is a guide to how the templates are to be assembled. REMEMBER – The Master Template is also a mirror image and shows the printed side of the paper templates. 14. Unlike in the case of the templates, numbering or alphabetical order does not work here! So that it is not necessary that A is joined to B is joined to C etc…Follow the assembly instructions given in the pattern (Instructions File). In case of confusion – yes – refer to the Master template. 15. There are several alignment markers in the form of crosses and tiny lines cutting across the seam line. Use these to pin the templates together. 16. You can tear away much of the paper before you start assembling the templates, especially if it does not have any alignment markers! 17. What you need to be careful at this stage is which edges you join and which template is on top when it goes under the needle. How do I know? Guess! I think I have listed all the things to be taken care of when paper piecing these blocks! In no time you should have a perfectly pieced and assembled block. If you can think of anything else, do share it here! Before I forget, here are the promised pattern downloads for the Sapphire Fire Block! The files are huge, and may take time to download. You need Adobe Reader on your system(downloadable free online) to be able to view/ download these files. Happy piecing and quilting! 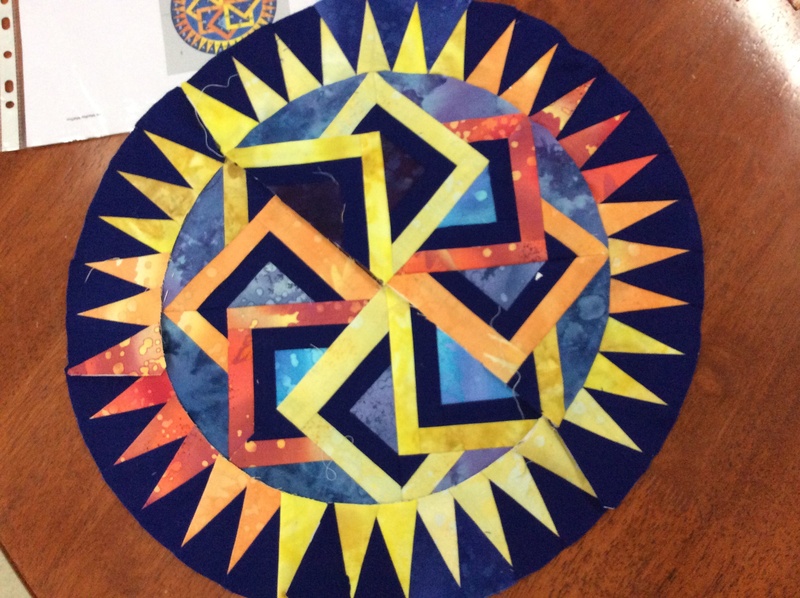 Instructions – for Sapphire Fire, Block Four of Dusk Round the Year Quilt. 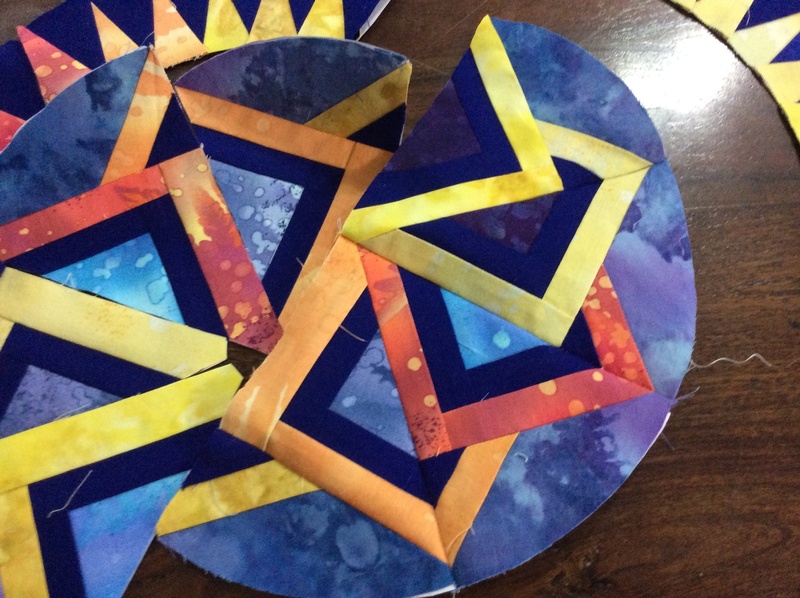 Paper piecing templates – for Sapphire Fire, Block Four of Dusk Round the Year Quilt. This “SAPPHIRE” is the fourth block in the Block of the Month quilt `Round the Year‘. I have made it only in the Rainbow colourway; the other – Dusk colourway – remains pending, as I am on enforced rest with an acute attack of sciatica. But don’t worry, the templates and instructions files for Dusk are ready and are being published in a separate post. This is a very simple block to piece and I am sure even beginner paper piecers should be able to manage without step by step pictures. Like the previous three blocks, this is also paper foundation pieced. The fabric requirements and Instructions for paper piecing and assembly for the RAINBOW colourway for this block can be downloaded as .pdf files from the link at the end of this post. Adobe Reader , which is required for .pdf files, is available for free download online. So here we go! 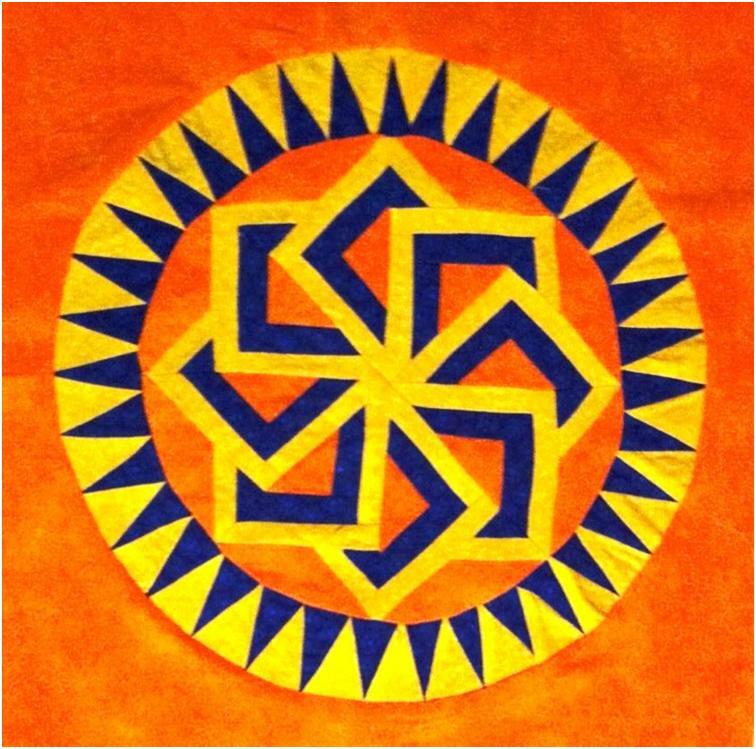 Finished Block size: 18″ square with 15″ inset circle. REMEMBER – The Master Template is a mirror image and shows the printed side of the paper templates. You can also use it to try out your own colour schemes; use colour pencils! 8 wedge templates numbered A, D, E, H, I, L,M and P.
8 spoke templates B,C, F,G,J,K, N and O . 2 background templates Q and R for the outside square. Cut 4 of each, the additional fabric margin is kept on the straight long edge. 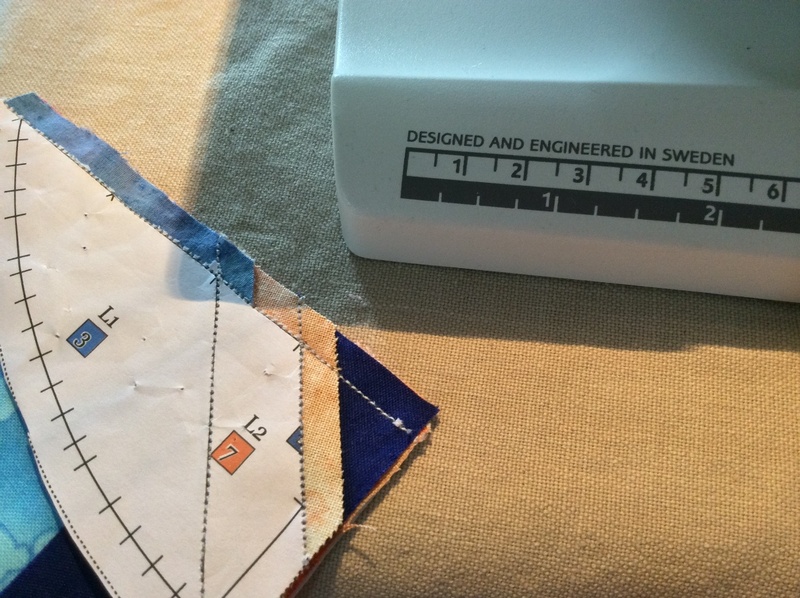 Add a margin of 1/2″ to 1″ on the straight edge when cutting fabric for the background template. 2. Take a print out of the Instructions file and keep it at hand for reference. 4 . 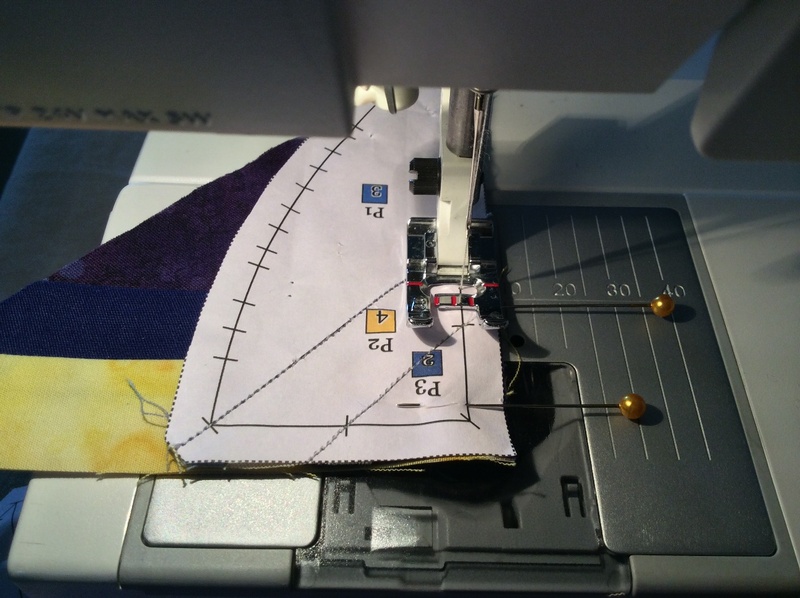 Pin the fabric pieces to the respective templates to avoid confusion when sewing. 2. Piece the spoke templates and arrange according to the master template. Trim to template size. Each of the wedge templates is joined to a spoke template. So, you join A to B, C to D, E to F, G to H, I to J, K to L , M to N and O to P. There are markers on the templates to help you align the templates correctly. Be careful you do not join 2 wedges together, or you will have y-seams to contend with! Like this! I joined two wedges together. Here I am adding a spoke to the wedges. When I started joining the spoke on the other side, I was confronted with a y-seam! At the end of this, you should have 8 wedges equal to 1/8 of the circle. I have assembled my circle in quarters, don’t let that confuse you. Join AB to X, CD to Q. EF to R, GH to S, IJ to T, KL to U, MN to V and OP to W.
Join BAX to CDQ …etc to obtain 4 squares. Assemble the 4 squares; square up the block to 18.5″ . We are done! You can download the paper piecing templates and instructions ( including fabric requirement) here. 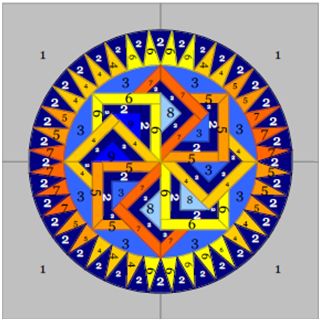 Templates – For paper piecing Block Four SAPPHIRE RAINBOW of the Round the Year BOM Quilt. 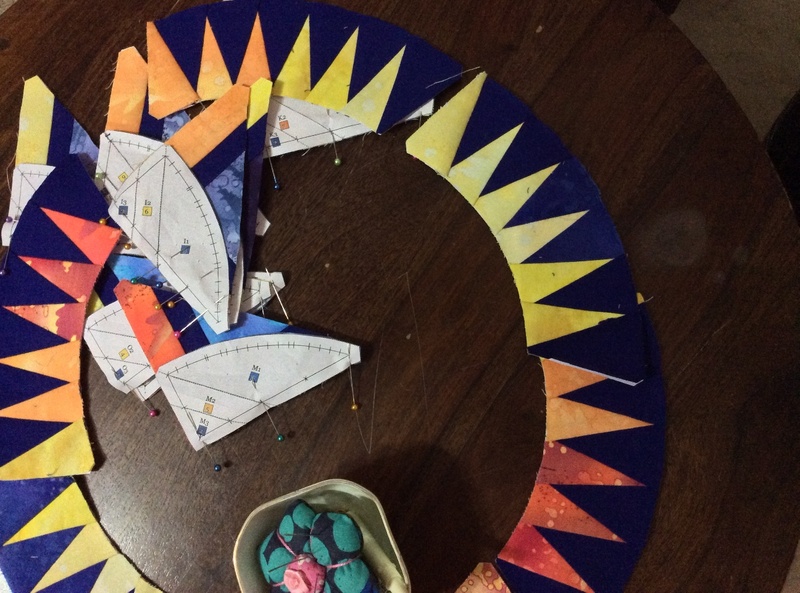 Instructions – For Block Four SAPPHIRE RAINBOW of the Round the Year BOM Quilt. Super Easy Dahlia Quilt Block – The Jaya Paperless Method! What if I told you there was a method for piecing the Dahlia quilt block that uses no paper piecing of any kind, just one simple template and some simple, good old strip piecing? No `y’ seams either? And, it is entirely machine stitched? So happy to introduce you to the paperless Jaya Technique! For those of you wondering what the whole hullaballoo is about, here is a bit of history! The Dahlia quilt block is arguably one of the most difficult quilt blocks to piece. The traditional block is either English paper pieced or hand pieced, machine piecing is not such a great option, as all edges are curved on each piece! Add to that several y-seams, and things get really, really complicated. As such, you will rarely come across a quilt with several small Dahlia blocks; it is usually one giant Dahlia covering the entire quilt. Traditional Dahlia Quilt Block – All edges of the `petals’ are curved! With the popularity of foundation paper piecing, the block is simplified somewhat, without taking away its beauty. One edge of the ‘petals’ is straightened, and the block is pieced in arcs on the sewing machine. This what the arcs and the pieces look like! These arcs are then assembled to make up the block. I love paper piecing and browsing the net came across a method where foundation paper patterns are chain strip pieced. I decided to try that out with the dahlia block and it worked! Chain strip piecing the Dahlia arc templates! 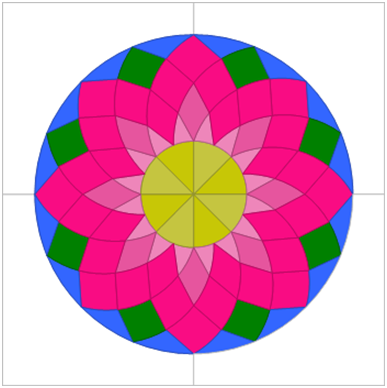 This made piecing the Dahlia templates a piece of cake. I shared this method with you when we constructed the first block Dahlia for my Block of the Month quilt, Round the Year. And then, a fellow quilter who was doing the quilt came up with a truly, amazingly easy method for piecing the Dahlia quilt block! Those of you who have been following this blog may remember I had promised to share this brilliant technique with you – a method I am going to call the paperless Jaya Method after Jaya Parker, who came up with it! This method uses no paper piecing of any kind, just a simple template and some simple, good old strip piecing! No y seams either and it is entirely machine stitched! In the beginning I joined strips that were the width mentioned in the fabric requirement section. Once I had printed out the templates I realized the strips were too wide so I adjusted the widths by sewing additional seams on the back. I picked the lotus design envisioned by Madhu. Based on the pattern I figured it would need 2 separate strip sets. The second strip set was made correctly, taking into account the measurement adjustments needed in the first! Cut 8 arcs from each strip set. I pinned the template using 2 pins for cutting out the shape the removed paper before sewing. Strip Set #2 ready for cutting and template in place! I used no letter codes for joining. I joined the arcs from outer edge to inner circle. Stitched very very slowly . I set my machine to its slowest speed. Coaxed the arcs and curves so the strip seams matched from one arc to the next. Opened out frequently while joining as the individual ‘petal’ seams curve down and just joining seam to seam may not open up on point. I seam ripped a few times to achieve this, though still not perfect . The lotus pattern was more forgiving as there were a lot of pink strips with identical fabric. Joined 8 arcs together alternating an arc from each strip set. Repeated to make 2 halves or paisleys or yin and yang that are basically identical . I just joined 2 pieces of fabric squares – I used a dark and light yellow fabric square (7 inch square each)to each other right sides inside. Stitched 1/4″ away from all 4 edges. Cut 2 diagonals in criss cross fashion on the square after sewing edges and voila …I had 4 hsts! Joined in sets of 2. I used a bowl that was slightly larger than the center circle template to cut out the semi circles. 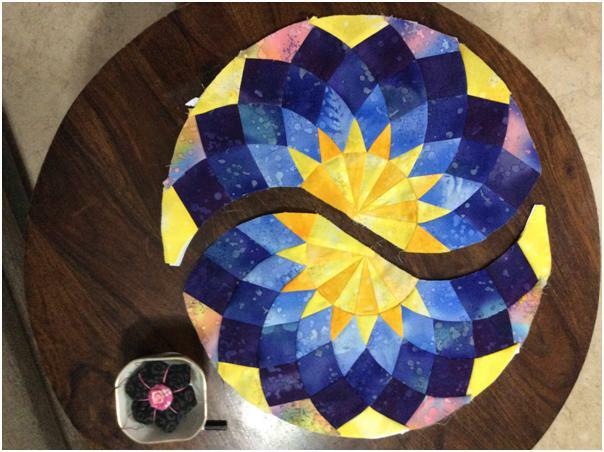 Joined each semi circle to yin and yang. Jaya’s yin- yang or twin paisleys! My semi circles were slightly larger than the template but this helped me even out my inner circle with my slightly uneven white triangles. These were not perfect as this was not paper pieced . I trimmed off the excess yellow fabric on the wrong of the center after sewing. Thank you, Jaya! We love your Lotus and we love your easy method Dahlia! As I read an reread Jaya’s method, I realised that you can use as many strips as you like and the method would still work! But the placement of the template is important. The seams have to be exactly parallel to the seam lines on the paper template. I am working on a super template that will make all this less confusing. Actually, it is ready, but I need to write out the instructions. Till then, happy quilting! Author MadsPosted on September 9, 2014 August 15, 2018 Categories Free Stuff - Tutorials and Patterns, Patchwork of my lifeTags Dahlia Quilt block, Dahlia Quilt Block free pattern, Dreamcatcher Quilt4 Comments on Super Easy Dahlia Quilt Block – The Jaya Paperless Method! The pattern and piecing instructions for the Card Trick , the third of the blocks in my BOM quilt Round the Year were posted by me a few days ago. Incidentally, there are 26 templates and 14o pieces in this block…just so that you can boast about it! 1. 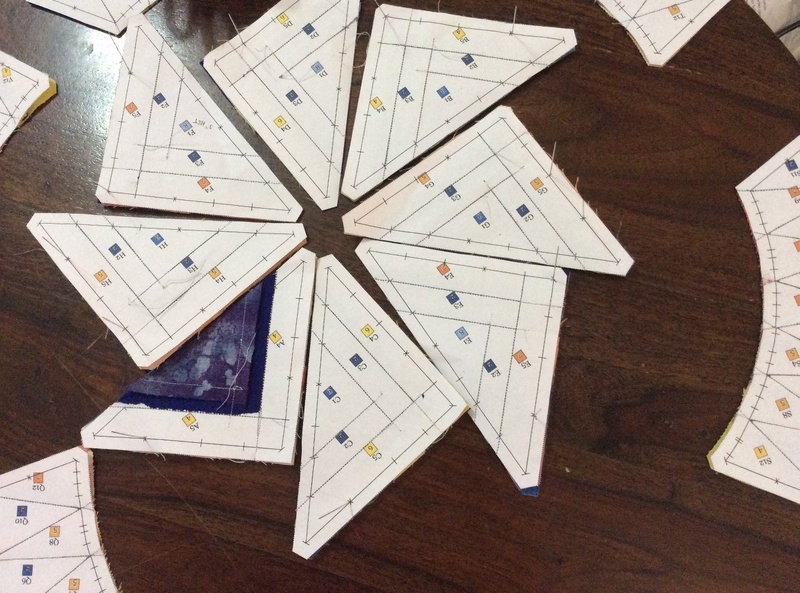 First, lay out all the pieced templates using the master template as a guide. 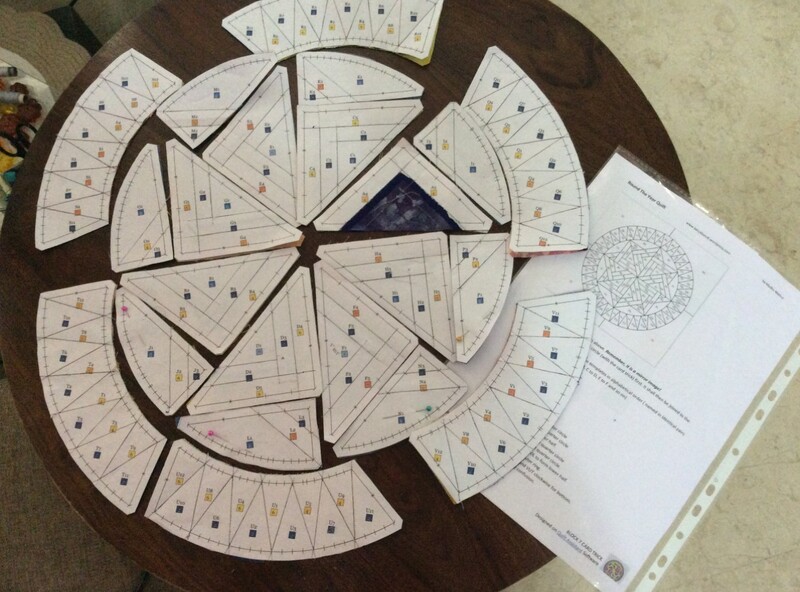 – Pin together each triangular ‘card’ to the corresponding wedge . If one makes a mistake and joins wrong pieces together at this stage, the ‘trick’ will not work, so follow the master template strictly! For accurate piecing, I find the alignment markers and crosses on the printed templates very helpful. 3. Sew to join together, removing pins as you are a stitch or two away. Chain piecing saves time and thread! Remove extraneous paper – from the seams and pieces without alignment markers. When the seams are pressed flat, some paper at the corners will go under the upcoming seam, and will be near impossible to remove later. Take care of that. Tweezers help, as well as the ripper. 4. Referring to the master template, join the segments in pairs, aligning on the markers with vertical pins pushed through. 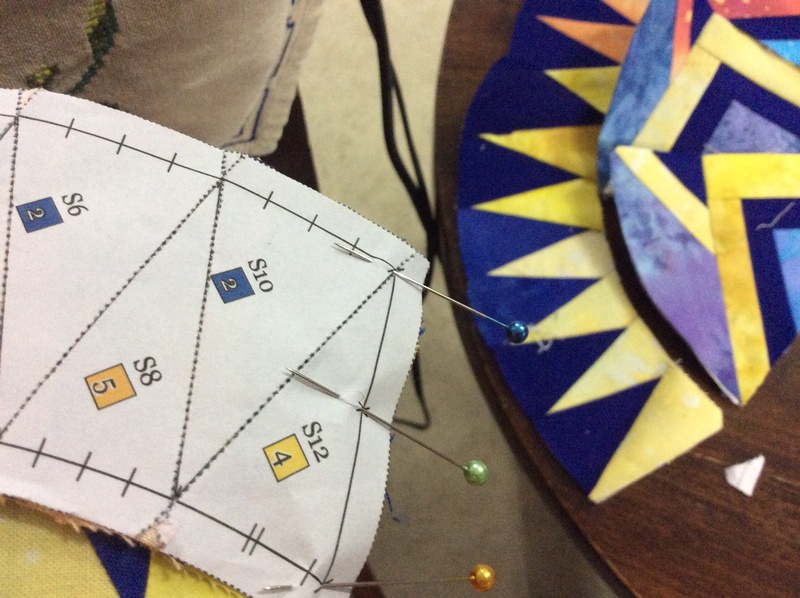 When securing with pins, I ensure that the head of the pin is either on my right ( since I am right handed) or towards me as the fabric goes under the needle. This makes it easy for me to pull out the pin slowly , without any fear of getting poked! 5. Join segment AI to CK to form a quarter circle. 6. Join segment EM to GO to form a quarter circle. This is as good a time as any to flip over to the fabric side to check if you have got everything in order! The little coloured piece on the wedge should be the same colour as the adjoining segment on its left. 7. Join the 2 quarters at edges C and E to make the top half circle. Top half of circle is ready! 9. Join FN to HP to form the last of the quarter circles. 10. Join these two quarter circles along edges D and F and the other half of the circle is done! 11. Now to assemble the arcs. There are only 6 arcs, so they will be joined in threes for the top and bottom halves. QRS makes one half of the ring, and TUV makes the other, moving anti clockwise as you look at the printed side. 12. Finally, the final step for assembling the circle! Joining the ring half to the circle half. Do not spare the pins at this stage! I put pins on every seam joint and on some alignment markers too! 13. I find it cumbersome to stitch a curved seam with the paper attached ! Knowing my arc is securely pinned and correctly aligned to the circle, I can afford to tear away bits of paper on the seam. 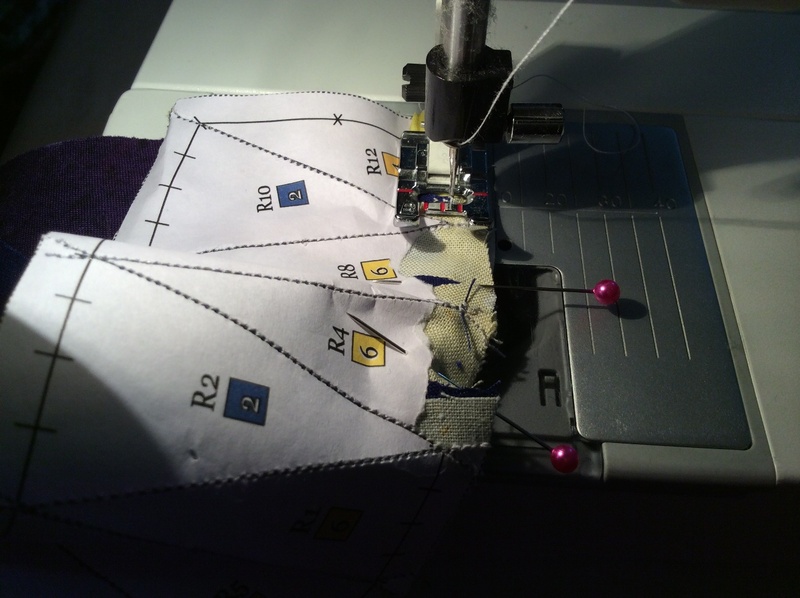 I also have a 1/4″ stitch on my Hasina, my HQV machine so I am assured of an accurate seam! You will notice I do not remove all the paper, as I will need the alignment markers on the outer edge of the arc when I join this to the background. Here is one half of my circle assembled, the other half awaits its turn! 14. Once both the half circles are ready, we can move to the background. Using the template W ( made of 2 paper pieces glued together) we had cut 4 fabric pieces a bit larger on the long straight edges . We join these in pairs, W to X and Y to Z. 15. Join one half of the circle to WX and the other to YZ. An alternative method for joining the circle to the background is to join the two halves of the circle and appliqué the circle on to a background square, using your favourite method. If using this method, cut your square about an inch larger and trim to size after appliqueing. There is also a freezer paper method for joining a circle to a background square, for which several free tutorials are available online. I hope you will enjoy making this block which comes up so magically! These instructions can be downloaded from here in a printable pdf file. Do share a picture of your completed block on my facebook page, the like button is on the side bar to the right! Happy quilting, till I post the rainbow version of this block some time next week. I have just corrected the link to the instructions for the Card Trick quilt block ( Block Three of the Block of the Month Quilt, Round the Year) posted earlier today in the main blogpost. The correct links are also given here! This is the third block of the Block of the Month Quilt, Round the Year, tested for me by Manju Narain! It is a twist on the traditional card trick, a block I always wanted to make but never got around to doing. So when I was designing this quilt, this was one of the first few blocks I included. Cindy Ellerbe tested the final version of the block! 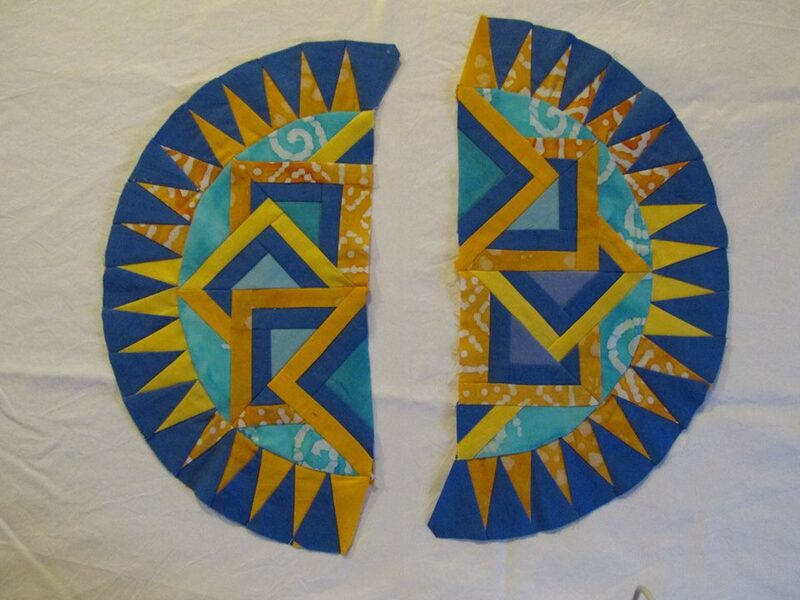 The block is foundation paper pieced and finishes at 18″; the inset circle is 15″. The instructions and templates can be downloaded from the links at the end of this post; patterns for the previous two blocks can also be downloaded there. Here are my strips cut from selection of fabric for my block. Take a print out of the Instructions File and keep it hand. It also contains the Master Template which shows you the template layout to help you assemble the block. Remember, it is a mirror image! 4. If you are using your own colour way, you can check how it will look by colouring the Master template! So now we are ready to start piecing. We piece the inner circle (with the card trick) first. It is then joined to the outer ring. The triangular template is like a log cabin of sorts! We start as always, with pieces 1 and 2 . The first piece is placed with wrong side on unprinted side of paper. Piece 2 is place on top of the first piece, so that right sides are together. Hold the template against the light to check if the seam allowance is okay – approximately ¼”. Pinning helps. 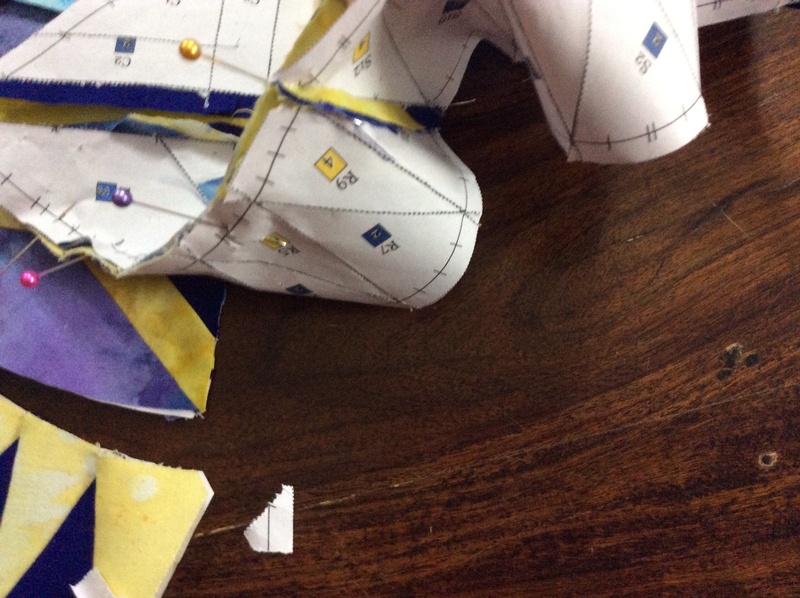 The beauty of paper piecing is the perfectly matched points and corners, without bothering about accurate ¼” seams! Hold against the light – are the fabric pieces overlapping the seam lines by 1/4″? Here are my templates with the first two fabric pieces pinned to them. 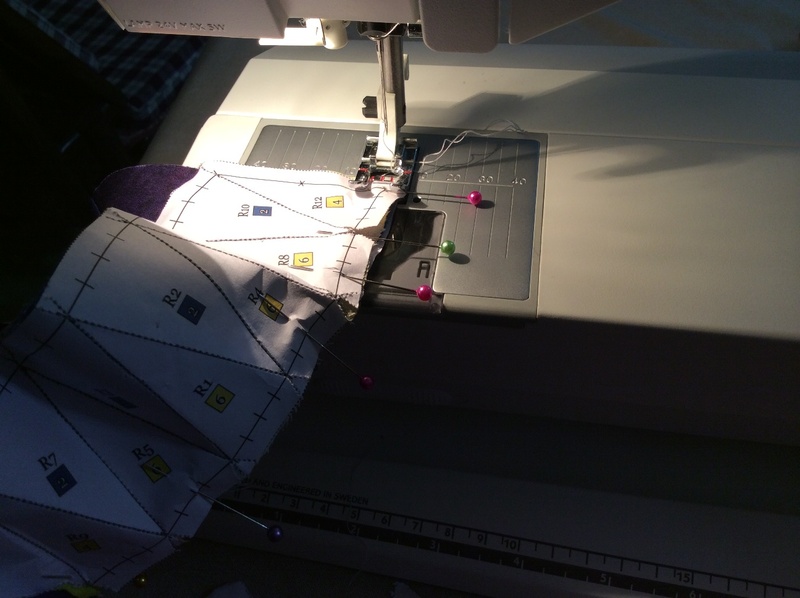 Check again – fabric should ovelap both seams! All the excess fabric is allowed to hang below the template, because when I unfold it after sewing, it should cover the piece 2 completely. The seam extends 1/4″ beyond printed seam line. 4. When sewing the pieces together, remember to take the seam about a ¼” beyond the seam line you are crossing. 6. 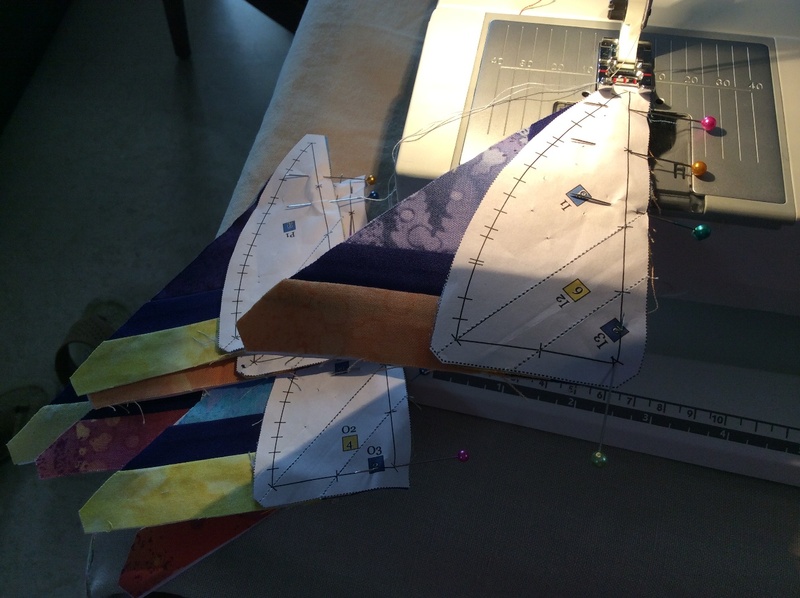 Fold back the paper to expose the seam and trim it to ¼”. Avoid trimming the overhanging rectangle till the whole template is pieced. 7. 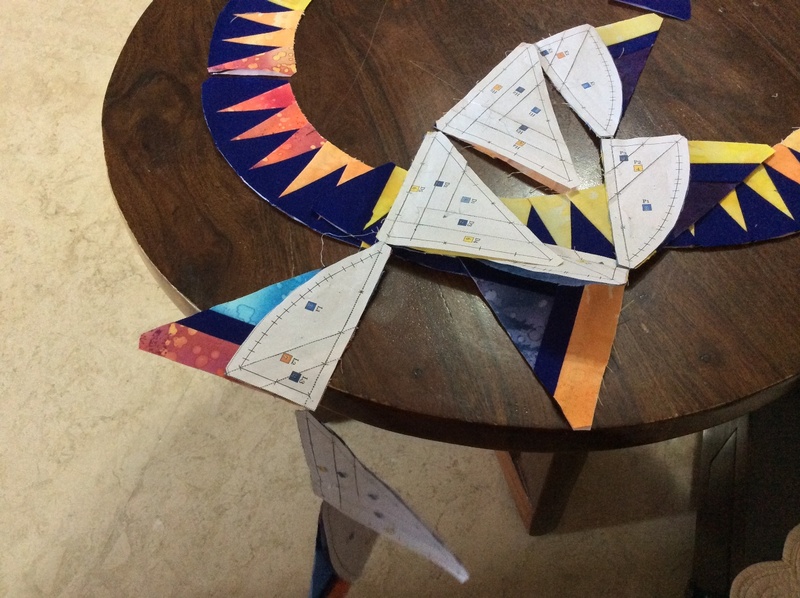 Similarly join the other pieces in sequence, opening them , finger pressing and trimming at each stage till all your triangular card templates are ready. 8. Now trim to template size. 9. 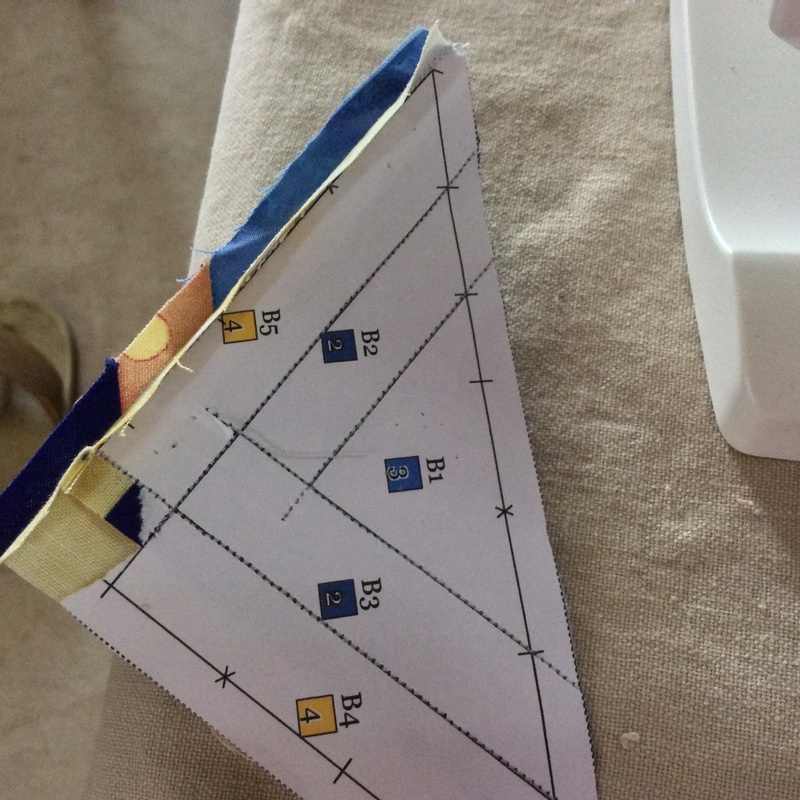 Piecing the wedges – These are simple enough, just 3 pieces each! Here also avoid trimming pieces to template size till the whole is pieced. The main wedge piece (blue here) is quite big and unwieldy. Pin it down before trimming . 10. Now time for a pause and some patting yourself on the back! Using the master template as a guide, put all the pieced templates together. Woo hoo! That is pretty! Perhaps you want to rearrange that a bit? 11. The final bit of piecing is the ring – this is much easier than you might think! This is the way I do it. These are the first three pieces attached and pressed open. 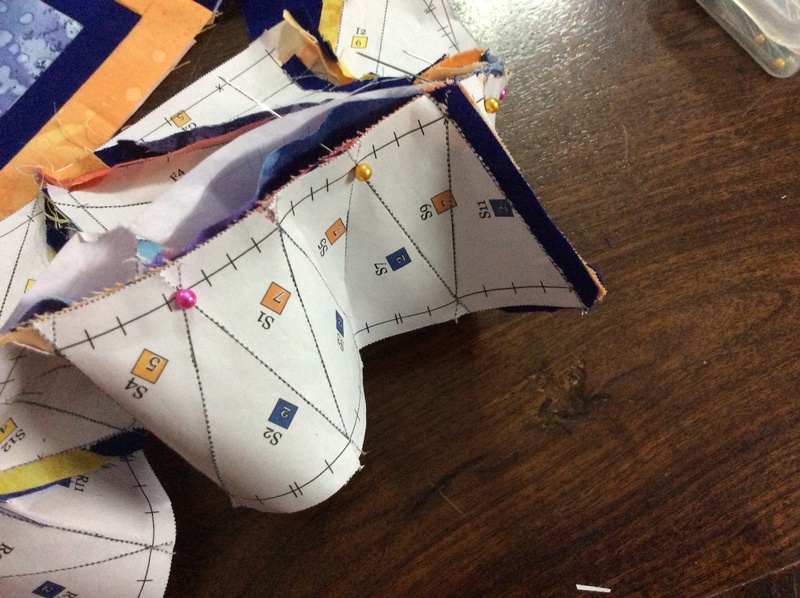 The seam between the blue and yellow pieces has been trimmed to a ¼”. Now fold the template on the upcoming seams. Turn around so that you can see the fold on the fabric pieces too. 13. Trim the rectangular pieces to ¼” plus beyond the fold. This is how it looks from the printed side. 14. Now we are ready to attach the next pieces. As always, we need to make sure that the upcoming piece will cover the paper section completely when pressed open. In no time all but two of my rings are stitched and I can’t resist putting it together. Card Trick Magic coming up! It is past midnight, but I can’t stop now! Quickly the last two rings are pieced. And here are all the pieced templates arranged to form the block. But now I am not sure if I really like the colours, are they too dark? So I tell myself it is a card trick in a dimly lit, smoke filled card room! That is my story and I am sticking to it. So, there! As usual, the assembly instructions will come up in a separate post. If you are wondering why I always do that – the reasons are technical. I write the post in an MSWord file and publish it to the blog directly. The file is unable to handle too many pictures at a time! Just to make up for making you wait for the assembly guide, I am going to show you two really lovely, inspiring pictures. Here are the two halves of the block tested for me by Cindy Ellerbe. And this is what Manju Narain did with her card trick block! Manju Narain’s stunner of a runner! Block One Dahlia pattern is available here. Block Two Evening at the Pond pattern can be accessed here.